A couple weeks ago, a story broke on the ability to produce meat/beef in the lab. The article itself is fairly slanted, but it’s the concept of lab-based meat that I want to talk about. Secondly, it is quite apparent that the agriculture industry I am a part of was VERY unimpressed with this scientific advancement. That concerns me a bit, at a pure science level, it’s hard to argue against this kind of thing. If essential nutrients or other positive attributes can be provided in a new, potentially useful form, what is wrong with that? Isn’t that the premise the entire biotech industry is built around? I understand that the potential success of a product like this would cause significant disruptions in the livestock industry for sure and spillover effects in the grains and all of agriculture. We feed cattle for a living, and would feel the personal affect very much. I would remind everyone that technology change always brings about massive upheaval and with it new opportunities. How do you suppose the very large and diverse horse industry felt as tractors started to take over farm operations? Or more recently, the makers of soybean chemical products like Blazer and Cobra when Roundup Ready soybeans so quickly dominated the soybean industry? (For those not in agriculture, apologies for some industry-specific product names there) It is easy to fear potential change without trying to be objective. So for the remainder of this post I am going to try to as objectively as possible consider lab-based meat, realizing it is near impossible to completely remove my personal opinion or bias. Lab-based meat would certainly find a market as a speciality product for those that for either health or ethical reasons would not eat regular meat. There’s probably only a small portion of this already small market that would be interested in the product, so for practical purposes it would remain a niche-based and expensive option. In this scenario the effect on the agriculture industry would be minor, and lab meat would simply be added to the dizzying array of food choices already available. I have very little information on the economics of producing lab meat. I have seen arguments that it will always be expensive, as well as arguments that it will fairly quickly be cheaper to produce than traditional meat. (Who ever knew that prime rib/pork chop would come to be known as traditional meat!!) As long as lab meat is an expensive option, I am pretty confident it will be a niche product. The more interesting/unsettling scenario would be if lab-based meat could be produced and sold at a price point less than conventional beef. From a pure economics view, it should be able to gain significant market share and cause major disruptions to a large, existing industry. This all assumes the public is willing to accept lab-based meat — that is by no means a sure thing. The public has a massive distrust for science messing with their food, and I suspect lab meat would be no different. It is just very interesting for me to note that in this case, the general agriculture industry tends to side with the anti-science crowd and support the “back to nature” concept! Anyway, I’m thinking a lot about the idea of behavior change recently. For those involved in agriculture agvocacy, it really gets to the core of what we are trying to accomplish. We see a lot of garbage/lies/misinformation out there regarding food production today, and ultimately that information causes what we believe is bad behavior. And it’s important to note here that oftentimes sound science, reasonable options to properly manage a resource-limited planet, get swept under the rug because of mis-information or lack of knowledge. But ultimately what we want to accomplish in agriculture agvocacy is having influence in order to change behavior. Thinking about this, changing behavior can be much larger than just what we eat. Changing behavior is a desired goal in many, many situations. If your a parent, you get the need for changed behavior! (well, if you have anything resembling normal kids that is…) As a society we have an entire criminal justice system built around attempts to change behavior, although one could really question whether the approaches used are working there. We may work with people, go to church with people, have friends, and if we’re in the mood to be honest admit that we ourselves have behavior that needs changed. In all of these cases, I’m struck by one thing: Almost without exception, true, lasting, genuine behavior change is a slow process. We all make a big deal about dramatic conversions.. the sever alcoholic that came home one night, vowed never to drink again and succeeded. The cheating spouse who finally decides they’ve had enough of the lies and deceit. The crazy foodie who meets a couple of farmers and dramatically changes her views. But for every story of instant change, there’s a hundred more of painfully slow if any progress, of two steps backward and only one forward. And now you see the real reason for my post title, patience is the single virtue I think we all need more of. Especially so in our 24/7 instant answer world today. Change takes time, change is slow, real lasting change is not easy, but worth it. This applies as much to agriculture agvocacy as it does to many areas of life. We seem to spend a lot of time worrying about what’s all being said online. We complain that some folks are preaching to the choir, we complain some folks don’t reach outside the choir “right”. Some complain that folks like to #thankafarmer, they feel it’s too conceited/proud. Some are grumpy at those that don’t like #thankafarmer. There’s folks that feel like organic farmers are too pushy and don’t respect their conventional counterparts. There’s folks that think conventional farmers don’t show organic farmers enough respect. There’s people like me that just write blog posts complaining about all of it!!! (oh yea, and there’s folks that are going to HATE that I did not ever proofread this blog post, that I probably did a massacre to the English language with untold grammar and spelling errors) Some will hate that I use too many capital letters, some will hate that I use too many multiple punctuation marks. You know.. do what you want, do what makes you happy, follow those people you care about.. if you don’t like my blog, don’t read it. If reading it bothers you, find something more enjoyable to do, life’s short, there’s 5 billion people out there you can connect with. We (or any other two people) don’t have to, seriously. It’s ok, just because we are all advocates doesn’t mean we have to all be friends, that would be crazy. It’s ok not to like something, it’s ok to not want to participate/be a part of something you don’t see any value in. People have emotions, they have feelings, we get along with some, we don’t with others, social media doesn’t change that.. we shouldn’t expect it to. Today, corn planting commenced at Grimm Farms. We’ll, that’s not entirely true. 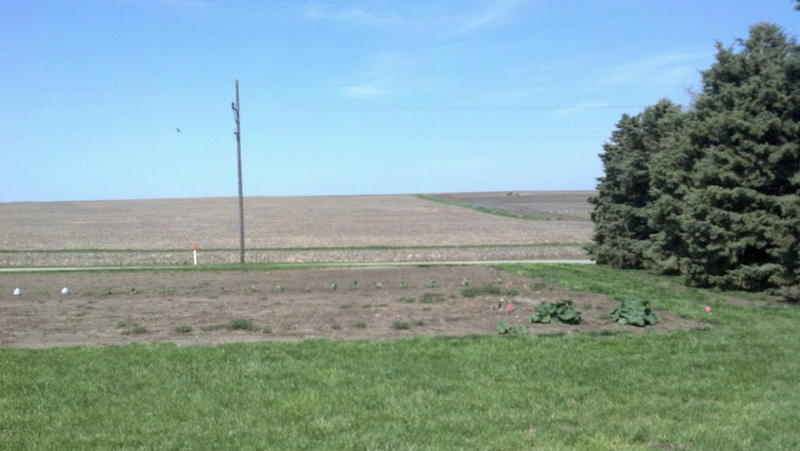 We actually planted some corn on April 5th, but the decision to do so was so heavily questioned by my internet farming friends (the forecast was very wet/cold I’ll admit), that I dared not make too much an issue of it. Except for some soil washing from all the heavy rains, the agronomist reports that corn looks like it’s doing fine to him. Which I will admit made me breathe a sigh of relief! So, while we technically started planting corn April 5th, today is the day corn planting is really happening in a significant, confident way. For us, I think it was the flood year of either 1993 or 1995 that we last planted a large portion of corn in May, so this is unusual. However, after a long cold spring so far, it feels great to be back in the field on a sunny, 80+ degree day! And one other note, regarding the title of this post… My life as a farmer consists of sitting at a computer writing a blog post on the day we are planting corn! I know there are those farmers who with a combination of things like Ipads and Autosteer compose blog posts in the field. I am not one of those, unfortunately. Basically, as long as the planter is running smoothly, and seed, etc. is lined up in front of it, I do not get to drive the tractor (nor would I honestly want to). So this post is written from the much more boring confines of the shop office! It’s a lot different today. While I think that is a good thing, it’s not without some growing pains. For me personally, I’ve written before that on any personality test, I am a very strong introvert. One of the results of that is that my connections are fairly few in nature, but the ones I have are often quite intense. As agvocacy has evolved, as my role has shifted, as others have went different directions, those that I work regularly with has shifted as well. However, I know this.. Everyone I have EVER met in this work is just as passionate, believes just as strongly, cares just as much about sharing, teaching, building connections as ever. The example I think of is this: I am a Kansas cattle feeder, it’s the specific little corner of agriculture I’m in. Yet, I have no connection to a very large percentage of other Kansas farmers, or other cattle feeders. As social media evolves, it works the same way. I only have a relative handful of folks I am in regular contact with. Now, for all you extroverts out there, those of you that maintain many, many numbers of friends and contacts. First I envy you.. Well, I envy you until I’ve had to be involved with a large group of people for more than a few hours, than I don’t envy you at all, quiet solitude never looked better! But the same basic principle applies. I don’t know what the maximum number of realistic contacts is? I do know even for the best at this there is an upper limit. It doesn’t matter how many followers, friends, admirers, or creepers you have.. there is a finite (relatively small) number of people we can truly be connected to. But this is not a bad thing, it is just reality. If I was a better graphic artist I would draw a diagram.. there’s not a huge rope linking some of us to massive numbers of people there’s an interconnected web, some of us with thicker strands than others, but each just a relatively small strand, linking to a few, those few to a few more, back around to others.. In the end, the strength of the agvocacy movement is the interwoven set of multiple connections, not the size of our individual Rolodex (some of you may have to Google that..). Yea, I realize that would be soo much better with a visual! Your highlight of an event filled Superbowl, was Dodge’s “God Made a Farmer” commercial. Carrie Mess talking about how she hopes this is read at her funeral.. No Carrie’s not morbid like that, this just hit close to her heart. Katie Pinke found hope and peace. And reflected on the dual worlds of marketing and agriculture she has spent her life in. Brian Scott, farmer from Indiana, adds his thoughts as well. Sarah Bedgar Wilson shares her thoughts. Fortunately there’s the internet archive as Sarah missed the real time event! Brandi Buzzard Frobose talks about why this is her favorite commercial of the night. She also mentions the Clydesdales, which might have done better in the ag community if there hadn’t been such strong competition! It brings a lot of joy and happiness to first, see Dodge and whoever is doing their creative work being willing to take the risk of remembering farmers and not ignoring the delicate issue of faith in a public forum. And a shoutout to all of my Agnerd friends who by putting the story in your own words have helped make it a milestone event for agriculture! Are you an advocate and wrote about this? drop me a note, I’d love to know and add to the list! My public online life is mostly consumed by agriculture. My faith as a Christian is an important part of my life as well. Sometimes, I find the two intersecting in strange and fascinating ways. I find winter a good time to read, and I’ve been reading works by a couple of authors that for the sake of this post fall slightly outside mainstream Christian thinking in this country. It’s easy to find perspectives online about these authors. Oftentimes I find them accused of various travesties against the Word of God. Or they are accused of seeking publicity, financial gain, etc. Yet, when I read their work, what I mostly find is personal stories of their journeys through life, how they got to where they are at in their faith or beliefs. I do not claim to have a direct line to God to know if they are “right”, but I do find their experiences inspirational. The parallels in the ag industry are strong. For the massive industry that has become our modern food supply, it is simply made up of individuals – farmers, researchers, truck drivers, janitors, assembly line workers, many, many more. All with individual stories to tell. It can be so easy to bad mouth the system, or badmouth a way something is done, but the vast majority of the time you simply have individuals doing the best they can with what they have. Is it right? Is it how things should be done? Little different than religion, those are great philosophical questions, but the system as it exists, is simply made up of individuals taking what they know, what they have, and trying to do their job. I think that’s an important thing to understand.